Not playing in the I-95 Flames of War 'Doubles' event this year, I was able to try out and watch some other games that I would have otherwise missed. 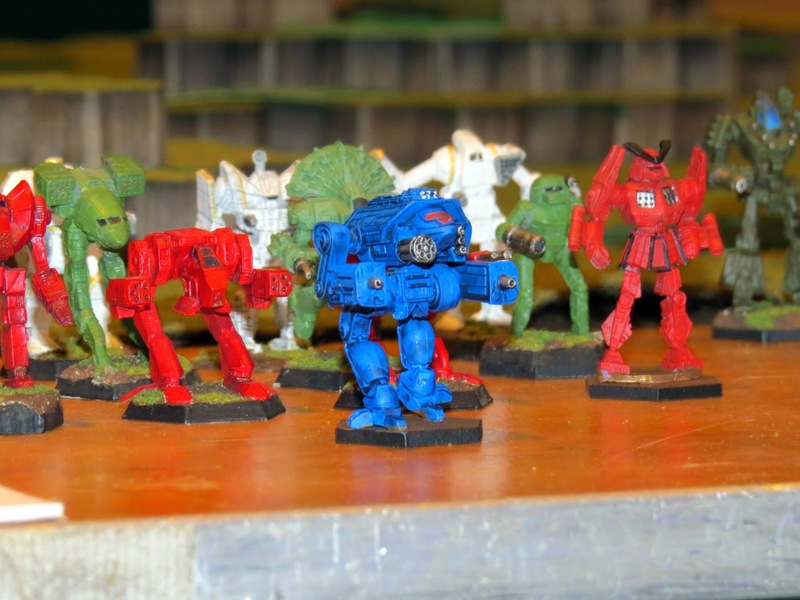 Tristan and myself found an old game that we had basically both 'grown up' with....Battletech. It's the game that got me into tabletop gaming nearly 20 years ago. That's a long time for any game to hang around, it disappeared a few times off and on over the years and now has made a decent comeback with a new starter box, some new mechs and updating the storyline. We moved on from that in the afternoon to walk around and check out some of the other games taking place. I really wanted to try 'Jihad', it's a 28mm(?) moderns game played out on the streets of (insert middle-east city name here) and you get to play the role of a convoy commander, a squad of US soldiers or even fly around in helicopters blowing stuff up! That game filled quickly and unfortunately did not have any empty slots to play. Moving on through the convention center, myself, Tristan and Dennis decided to try out a civil war skirmish game where we each controlled 5-6 models of various civil war era troops. It was based on the 'High Noon' rule set, it was a little slow to start and maybe we had too many people on each side, but I had a good time with something new and would play this game again. I would only suggest a fewer number of players participate in order to speed things up a bit. Stick around, this weekend I'll get into the Flames of War Nationals, the new layout of the site and even some talk about other games. Napoleonics, Boss Monster, old video games and more!